As I’m sure you’re all aware, viral Facebook posts are very much like the new chain email—a rapidly spreading rumor that suddenly explodes into a full-blown urban legend. 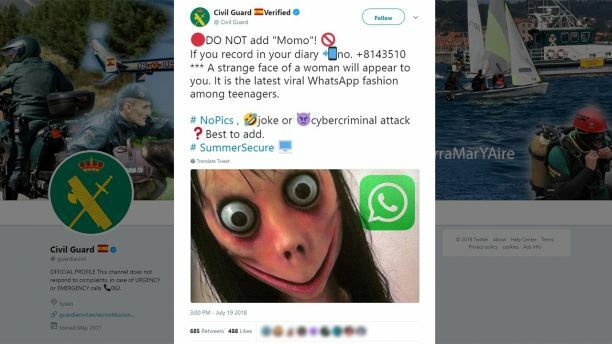 It’s difficult to know for sure if this is what’s happening with “Momo,” a new viral meme that is allegedly attached to a teenaged suicide game on the popular messaging app Whatsapp. As you can see, the picture is definitely creepy, but the legend itself is much creepier. Some swear the rumors to be true, others aren’t convinced. One thing is definite: police in Buenos Aires have looked into a connection to at least one suicide, confirmed by the Buenos Aires Times. In late July, a 12-year-old girl outside the city committed suicide and filmed the events leading up to her death. She was allegedly texting a person called Momo on Whatsapp who had the profile picture above. "The phone has been hacked to find footage and WhatsApp chats, and now the alleged adolescent with whom she exchanged those messages is being sought,” police said in a statement. They believe that the perpetrator’s “intention was to upload the video to social media as part of a challenged aimed at crediting the Momo game" for the girl’s suicide. Apparently already circulating in Europe at the time of her death, the Momo game creates objectives for those playing by accessing their personal information. Several phone numbers that have been linked to Momo have been passed along from friend to friend, from message board to message board, with kids and teens texting the number the way we might have said Bloody Mary into the bathroom mirror three times. There have been reports from users of Momo replying with disturbing videos and threatening language, and the eventually encouragement of self harm and suicide. The fear of Momo has mainly stuck on the Spanish-speaking Internet, but it has started to become a popular legend in Japan and the US as well. 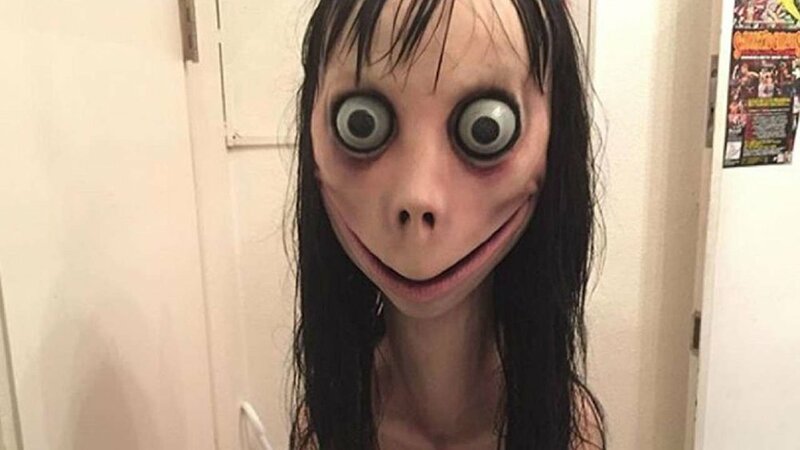 The picture began spreading rapidly on the English-speaking web when a Redditor posted the photo to r/creepy with the title "Momo" on July 10th, 2018. It received more than 4,700 votes and 900 comments within a couple days. On July 11th, a popular YouTuber named ReignBot explored the rumors in depth. 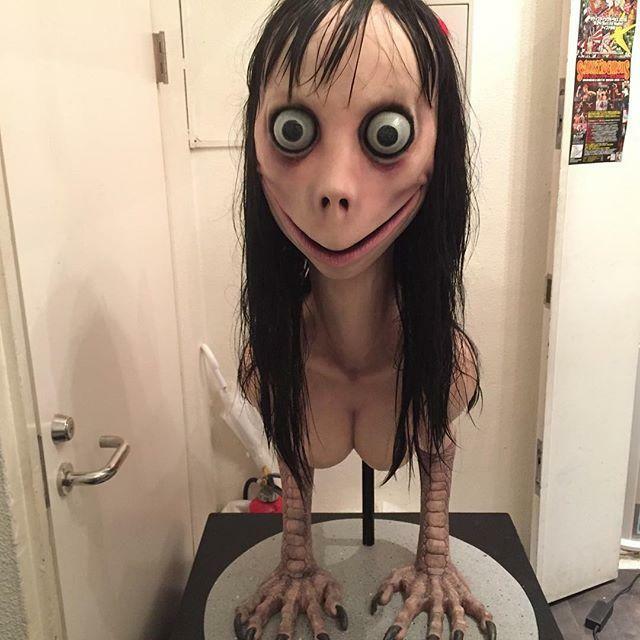 As revealed by the user, the image attached to Momo, the strange face with the impossibly wide eyes are V-shaped smile, was quickly found to be a cropped version of photo below, posted by a Japanese artist on her Instagram. Obviously the photo’s source proves that there isn’t anything supernatural going on here—but it doesn’t prove that someone isn’t using the image for nefarious reasons. The reports of Momo’s suicide game are incredibly similar to those that circulated in 2016 in Russia about the Blue Whale game. This game also allegedly leads users through escalating challenges over a period of 50 days, eventually demanding self-harm and suicide. New stories purported that 130 suicides have been linked to the game, but those links were weak at best, and no link has actually been proven. In fact, the original article was officially discredited. Something that experts have pointed out, though, is that there have been several instances that appear to be copycats to the Blue Whale Game that have led to self harm and online bullying, but only after the media explosion. Two Russian men have allegedly admitted to manipulating teenagers through this game, though it has not been proven and has mostly been reported in tabloid magazines. With the release of the Slender Man movie, many people are thinking about the danger of these types of Internet stories. Some theaters are refusing to play the film because of the real-life stabbing of 12-year-old Payton Leutner by two other 12-year-old classmates who claimed that an allegiance to Slender Man had made them do it. Some feel that the film is exploiting this tragedy, and only four years after the fact. Luckily, Payton survived the attack, but it does go to show that those who may be a little too young to think critically are at risk to be confused by the extreme amount of urban legends and conspiracy theories that are raging online at any given time, and can be inspired by them. However, almost always these stories are harmless urban legends, just like the ones heard on playgrounds when I was a kid, before the internet took over. It is the adults that tend to take it to far: "We are going through a moral panic, and the response seems to be moral education. It discounts the root cause of why people are suicidal," Sunil Abraham, an internet researcher, was quoted as saying about the internet suicide game hysteria. Educators all over the world have spoken with children about the dangers of the Blue Whale Game. We tend to believe in the wildest stories we can, and the Momo Game and very likely the Blue Whale Game are hoaxes that caused their respective moral panics. When we give attention to these outrageous claims that immediately reek of urban legends, we spread ideas that can be dangerous to young people and to those who have not or have not been able to manage their own mental health. Rather than figure out ways to better talk to young people about mental health and suicide, we start to educate about farfetched horror movie plots that don’t exist, and it doesn’t help. In fact, it may very well do the opposite.